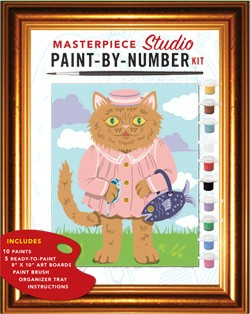 This personal studio includes everything budding artists need to paint a modern-day masterpiece. With numerical guidance at every step, painters choose from five classic yet contemporary subjects: Fancy Cat, Pink Flamingos, Still Life with Hamburger, Epic Spacescape, and San Francisco Street Life. Complete with 10 pots of acrylic paints, a paintbrush, easy-to-follow instructions, and tips and materials for creating a DIY workspace, this kit offers a refreshing and quirky twist on a favorite pastime.